According to RBC Wealth Management, the number of rich Asians surpassed North Americans for the first time last year. This growth in wealth is highlighted earlier this year, by the Boston Consulting Groups Wealth report indicating that Singapore’s small island nation had the highest percentage of millionaire households in the world for two years running. The Asia- Pacific region in currently home to 3.37 million high net worth individuals(HNWI) – people with 1$ million or more to invest as compared to that of North America and Europe. Currently Singapore has a head start on its rival Hong Kong in the race to becoming Asia’s top wealth management center. 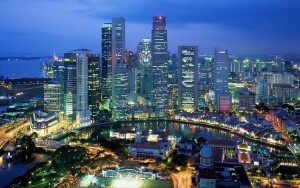 Singapore’s magnetism of being a safe haven continues to attract private investment from the region. Furthermore, the reports identified that Singapore’s single regulatory body, more transparent legal framework combined with its independence makes it a nation that has a strong reputation in the region with its emerging role as a private banking hub. Send us your views, or questions, about offshore banking. We would be interested to know what perceptions are and will be happy to answer questions. « Oh, Those Lucky Billionaires!